The Burlington High Level WC White Ceramic with angled extension pipes, now you can have your WC pan right underneath a window!! Simply use Burlington's Angled 'four part' flush pipes. Made to the same exacting standards as our other flush pipes, with unique Burlington's unique flushpipe Technology. The pipes are longer than usually required - and can be cut to suit the bathroom or cloakroom. You can use the angled flush pipes to mount the cistern at 90 degrees to the pan (as photographed) or to the left or right of the rear. 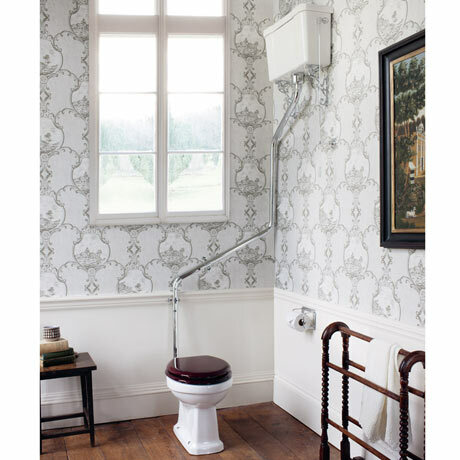 Make a statement in your bathroom with the High Level WC with angled extension pipes from Burlington. It evokes an air of luxury and is classically styled in a design of a bygone era. It offers superb build and craftsmanship from world renowned manufacturers in traditional bathroom items, Burlington. The body of the pan is Vitreous china for a strong and durable build, and the pipes have a brass interior making them robust to withstand the daily uses of the bathroom. It blends together design and structure in perfect harmony for the ultimate traditional finish. Burlington's high level cistern 'chain' is a rigid chrome pipe to allow you to push up for the 3 litre water saver or pull down for a 6 litre flush. Now you can have a high level cistern whilst saving water too! All Burlington's flush pipes are supplied with a chrome plated brass flush pipe nut cover to hide the waste nut outlet at the base of the cistern. Our nut cover has a reverse internal thread - so you can screw it onto the cistern waste outlet. Whilst this is far more complex to manufacture it ensures that the flush pipe cover does not ‘fall down’ over time. Each pipe is supplied with a brass clip housing a rubber buffer to protect the seat lid when raised. Our clips are designed to keep the pipe work 2.3 cm away from the wall - allowing access for cleaning, and the pipe will clear any dado rails - avoiding the necessity of cutting into wall features on site. Q. The waste outlet in this picture seems to be S type, through the floor. Can it also be installed with a waste outlet going through the wall - a P type?